On November 12, 1929, an American actress and a Princess of Monaco, Grace Patricia Kelly was born. And it’s a great occasion to look at her charming personality through collectibles. There are many various collectibles which were made in her honor. Some of them could be found on Colnect. Currently, you can find 30 stamps, 8 coins, 6 phone cards which are connected to Grace Kelly in our catalog. For example, several of these stamps were made in 1956 to represent her marriage such as the one provided below. Also, many of the items owned by Grace Kelly during filming or things signed by her are collected by people all around the world. Throughout her career, Grace Kelly starred in many successful films, such as High Noon (1952), Mogambo (1953), for which she won a Golden Globe for Best Supporting Actress, Rear Window (1954), To Catch a Thief (1955), and The Swan (1956). Those films became a golden classic of cinema and are loved by thousand people around the globe. In 1956 she retired from being an actress and married Prince Rainier III. She continued her life as a mother of 3 and a Princess of Monaco until her death in 1982, which was caused by a car accident due to her suffering a stroke. Do you have Grace Kelly themed collectibles in your collection? Share them here in comments. Yesterday, 25/08/2012, Neil Armstrong, the first man on the moon passed away at the age of 82. 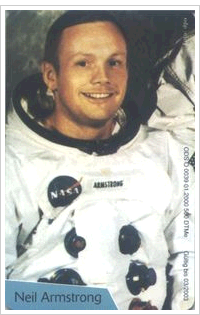 Armstrong was an American astronaut, test pilot, aerospace engineer, university professor and United States Naval Aviator. He was one of the first U.S. civilians in Space, commanding NASA's Gemini 8 mission. He became an iconic figure around the world as the first human to step on the moon, and will be remembered for it for generations and generations to come. His achievements as an astronaut and his historic arrival upon the moons' surface has inspired people around the world and ignited human imagination of space travel. The inspiration and appreciation produced many collectible items to be designed to commemorate those achievements. You can see commemorative Neil Armstrong stamps issued phonecards over the years. Many of the items that collectors on Colnect collect are in fact associated with certain historical events that have taken place over time. This applies especially to Stamps, Phone Cards, Coins and Banknotes. To commemorate these special historical events, countries release special issues of these items that depict images and information relevant to these events. Through our “Today in History Through Collectibles” Blog we will highlight special events in history by featuring Collectible items from our Colnect Catalogs that are associated with historical events that took place on specific days in history. Two hundred and twelve years later the gorgeous Vimanmek Mansion, the largest golden teakwood home in the world, is still one of the premier tourist attractions in Bangkok, Thailand. The Vimanek Palace's creation in February of 1900 by Thailand's King Rama V is celebrated beautifully in one of Colnect's featured collectibles: the LENSO City of Culture Vimanek Palace Phone Card. The world renowned mansion was constructed uniquely, without using a single nail with the golden teakwood. King Rama V built the Dusit Garden in between the Krungkasem canal and the Samsen canal and the Vimanek Mansion became its first permanent settlement, as King Rama V moved the royal family there. This Thai baht phone card captures the essence of the innovative architecture found with the luxurious Vimanek Palace, which was renovated in 1982 to serve as a museum of Bangkok's culture and decadence. The phone card showcases the scarlet roof and the curvilinear golden wood walls amidst a glorious emerald lawn. The card itself is good for three hundred Thai baht worth of international calls. The vast depths of Colnect's catalogs feature many rare, historic, and artistic artifacts in vogue with the Vimanek Palace phone card that is featured here today. Unique and amazing wonders of man's creation are celebrated for fun and, of course, for collecting. The world's biggest and most extensive phone card catalog has now surpassed 300,003 unique phone cards. The amazing growth of the phonecard catalog reflects the tireless efforts of many volunteer contributors. We would like to especially commend Ignacio F López Vico [iflvico] and Carlos Rodriguez [venezuelanphonecards]. Ignacio has been our dedicated and talented phone card coordinator for a long time before becoming our respected community manager. Carlos has filled Ignacio's role as a coordinator for a few months and has also been doing a fantastic job. The diversity of the catalog is incredible and many phone cards are continuously added from around the world. There are now 236 countries represented on our phone card catalog. Even during the last week, phone cards from 33 different countries have been added, including China, Iran, United States, Nepal, Russia, France, Israel, Greece, Luxembourg and more. Colnect's catalog, created by volunteering collectors for all the collectors in the world, is the world's biggest and most extensive phone card catalog. It's unique wiki-like nature is the main reason for its rapid growth and development. Colnect has started with only phone cards and due to Colnect's catalog success we now have different categories such as coins, stamps and more. We're always looking for more contributors to Colnect and if you have any phone cards missing on our catalogs, you're welcome to learn how easy it is to contribute to our catalogs. The unceasing growth of phone cards on our phone card catalog has now reached one fourth of a million. It is available in 50 languages, and it is the WORLD'S BIGGEST phone card catalog! 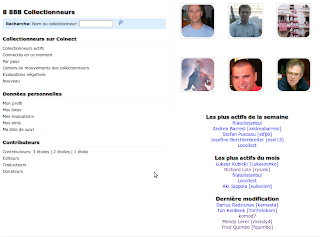 Collectors on Colnect use the catalog to manage their own personal collection. There are nearly 20 million items on collector lists on Colnect! The catalog's growth is possible due to the endless efforts of our phone card coordinators. We would like to thank and commend them: Ignacio F López Vico [iflvico], Trudy Hoogenboom [trudyh], Komdej Chulapprawut [komdej], Eyüp Güçmen [kolleksiyon], Jorge Pablo Villegas [Jorgepablo2005]. Colnect is presently and continuously working ways to extend more available resources for your collecting convenience. Check our phone cards catalog today. 250,000 PHONE CARDS TO CHOOSE FROM! Our phone cards originate from 231 countries around the globe. Our assortment continues to grow as new available phone cards spring up to our catalog. It's nearly 30,000 freshly added phone cards since we last announced 222,222. Are you a phone card collector with no Colnect account? Colnect is welcoming more phone card collectors to sign up in Colnect. Join the frolic of collecting. You will know why collectors stick with us. Colnect's phonecard catalog reached a new milestone today, as 230,000 phonecards have now been uploaded onto Colnect for collectors to mark in their "Collection", "Swap" and "Wish" lists. Tbis monumental achievement could not have made without the tremendous work of our volunteer phonecard contributors and especially our phonecards coordinator, Ignacio F. López Vico. 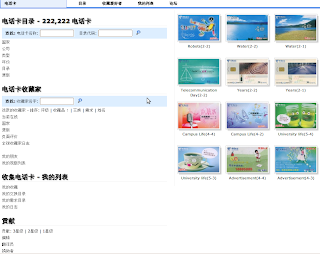 It is because of his efforts and the contributions of many dedicated collectors on Colnect, that our phonecards catalog, the world's biggest, keep growing so quickly and have already passed 230,000 phone cards. If you would to like to help upload some of the next phonecards or any other collectible to Colnect, please feel free to contact us. Colnect's phonecards catalog, which already was the largest in the world, has continued to grow and now features over 222,222 cards from 229 countries. This means that over 22,222 phonecards have been added to the site in roughly the last 3 months (since our last milestone), a reflection of the dedicated efforts made by our many volunteer contributors. We would especially like to thank the co-ordinator of the phonecards catalog, Ignacio F López Vico [iflvico], for helping to organize all these additions and ensuring that Colnect's phonecards catalog continues to be as up-to-date and comprehensive as possible. Brazil continues to lead the way in phone cards added to the catalog, with over 60,000 having been uploaded for Colnect collectors to mark in their "Collection", "Swap" and "Wish" lists. Germany and the United States also have notably significant quantites of phone cards on Colnect at more than 10,000 each. With such a dedicated team of volunteers continually supporting us, the sky is the limit for the future of Colnect's phonecards catalog and the site as a whole. If you would like to contribute in any way to Colnect, please don't hesitate to Contact Us. Colnect has reached yet another milestone today, as more than 8,888 collectors from around the world have registered to take advantage of our unparallaled features. This lucky Chinese number follows months of significantly accelerated growth in both new members and catalog items, trends that bode well for transforming Colnect into one of the world's most popular collectible sites. At its current pace, Colnect should eclipse the prestiguous 9,999 collector mark by the end of March. Colnect has also surpassed the 100,000 page view per day (or 3 million page view per month) plateau, illustrating the site's growing appeal to collectors. Although progress has been quite impressive, this only represents the tip of the iceberg for Colnect's full potential. We have imminent plans to add new categories such as gift cards, create or improve many more languages, and continue enhancing our existing catalogs. With the help of our many volunteers, Colnect will continue giving collectors an unmatched collection experience and reach even greater heights! In the long-term, we envision a site where collectors anywhere in the world can register and utilize Colnect entirely in their language of choice. However, this goal will only be achieved with the assistance of volunteers around the world. If you would like to assist Colnect in any way, you are always welcome to Contact Us.